Facebook (NASDAQ:FB) bears have prophecized the end of the Facebook ecosystem for a while now. Over the past few months, they’ve been right — Facebook stock has shed 30% since mid-July on slowing revenue growth, user churn and regulation concerns. But Facebook’s third-quarter numbers, which hit the tape after the bell on Tuesday, refuted the bear thesis that has dominated FB for three months. The numbers weren’t as bad as they were supposed to be. Instead, they were largely better than expected. They were even quite impressive in some areas. In response, Facebook stock is surging 6%-plus in pre-market trading. Could this be the turning the point for Mark Zuckerberg & Co.? Is a run back to $200 in the cards? Facebook’s third-quarter report was good enough to prove that the end of Facebook is not near. In fact, it was good enough to reaffirm that this is easily a 20%-plus growth company for the next several years with a solid foothold in the digital advertising world and margins that have stabilization and even rebound potential. Put that all together, and Facebook stock shouldn’t trade at $150 today. Instead, it should trade closer to $200. The Facebook platform and ecosystem are still growing. Despite sequential user base declines at Snap (NYSE:SNAP) and Twitter (NYSE:TWTR) in Q3, Facebook’s daily and monthly active user base both grew by over 1% sequentially in Q3. Meanwhile, the Facebook family of apps saw its unique monthly user count grow 4% sequentially to a whopping 2.6 billion, and the daily active base popped above 2 billion for the first time ever. Revenue growth is still robust, and won’t slow by as much as feared. Revenue growth in the quarter was still over 30%, despite just 10% year-over-year user growth, and that is due to robust 20% average revenue per user (ARPU) growth. ARPU growth is slowing (it was 30% a few quarters back), but the slowdown is expected to moderate. Q4 revenue growth is expected to decelerate at a mid-to-high single digit rate from Q3, versus a prior guide of high single-digit deceleration. Margins are holding up just fine despite huge expense growth, and the worst of the expense ramp is in the rear-view mirror. Although operating expenses in the quarter rose more than 50% year-over-year due to dramatically higher security and privacy spend, operating margins remained above 40% (down just 8 percentage points year-over-year) and operating profits still rose by over 10%. That is impressive profit growth resiliency despite huge expense growth. Moreover, full-year 2018 expenses are now expected to rise about 52.5% (versus 55% prior), while capex is projected at $14.25 billion (versus $15 billion prior). The company has a plethora of nascent but rapidly developing monetization opportunities which will reinvigorate growth. Across its entire digital ecosystem, Facebook has a ton of non-monetized real estate that is heavily occupied, including Stories (IG Stories and WhatsApp Status) and messaging platforms (Messenger and WhatsApp). Facebook is gradually developing monetization tools for these widely used apps (Facebook is the number one Stories app essentially everywhere in the world, and also number one in messaging everywhere besides America). As these monetization tools roll out over the next several years, Facebook’s overall revenue growth trajectory should re-accelerate. Overall, Facebook’s quarter was really good. It broadly eradicated near-term Facebook apocalypse fears, and confirmed the company’s long-term growth narrative as an essential digital platform still in the early stages of monetizing its broad, still growing, and heavily used ecosystem. It makes no sense that Facebook stock trades at the same valuation as those companies. Coca-Cola, Proctor & Gamble and McDonald’s all reported adjusted revenue growth of roughly 4% to 6% last quarter. None of them have huge margin drivers. Facebook, meanwhile, is growing revenues at a 30%-plus clip, and has huge potential margin drivers once presently exaggerated security spend tapers back. The only reason Facebook stock should trade at 20X forward earnings is if this company’s growth rates are indeed heading to the 5% range. But, third-quarter numbers and the fourth-quarter guide imply this is not the case. Even as management is focused on improving the Stories and messaging products (not monetizing them) and focused on improving security over growing profits, this is still a 30%-plus revenue growth company with 10%-plus profit growth. Over the next several years, the focus will shift from improving the Stories and messaging products to monetizing them. Once security measures have been amply improved, the focus will also shift back to growing profits. At that point in time, Facebook could easily turn back into a 40%-plus revenue growth and 20%-plus profit growth company. During that era, Facebook stock traded around 25X forward earnings. A 25X forward multiple on next year’s consensus EPS of $8.20 equates to a year-end price target of $205. That feels more like where Facebook stock should trade, rather than $150. 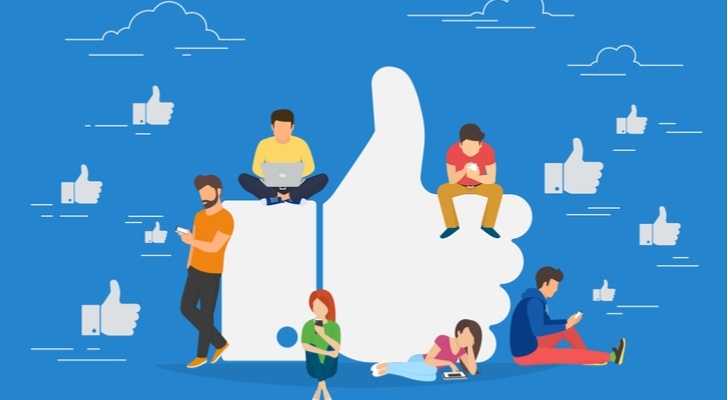 Third-quarter numbers affirm that Facebook remains an essential digital platform that is still in the early stages of monetizing its broad ecosystem. As such, present Facebook apocalypse fears are overstated and growth prospects are undervalued. The market will realize this and soon push Facebook stock higher. As of this writing, Luke Lango was long FB, KO and MCD. Article printed from InvestorPlace Media, https://investorplace.com/2018/10/facebook-stock-should-be-trading-much-much-higher/.